We seem to remember telling you how much we love lists. Another addition to the List Of Interesting Curtain Wall Experiments In West Chelsea, Manhattan, New York City is the InterActiveCorp building Frank Gehry designed for Barry Diller's company, between 18th and 19th Streets on the West Side Highway. The building continues Gehry's technical innovations in panelized buildings where each panel has a unique shape. 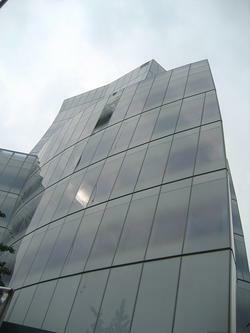 However the building carries the innovation to a level that surpasses even the American Center in Paris, where each block of limestone carried a unique curvature, or to an extent the curved brick at Case Western. 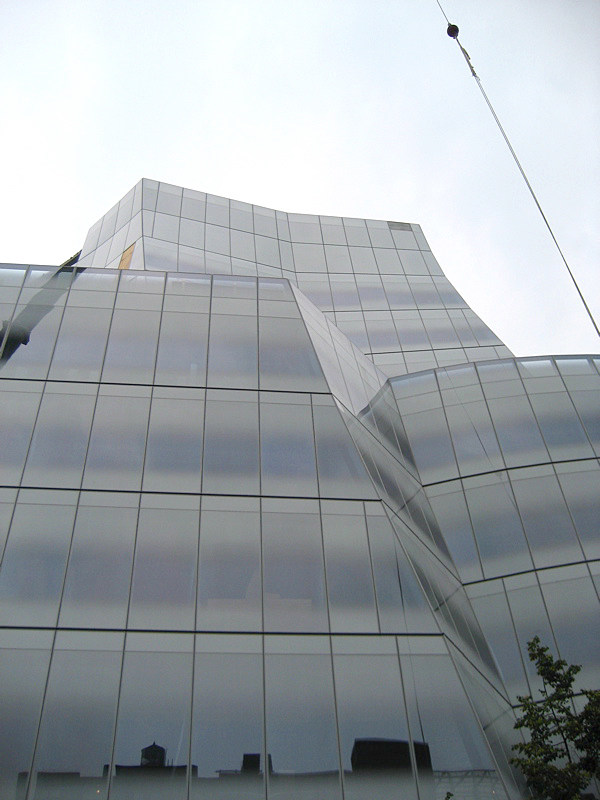 The IAC building's panels are curved glass curtain wall units; has he done this before? 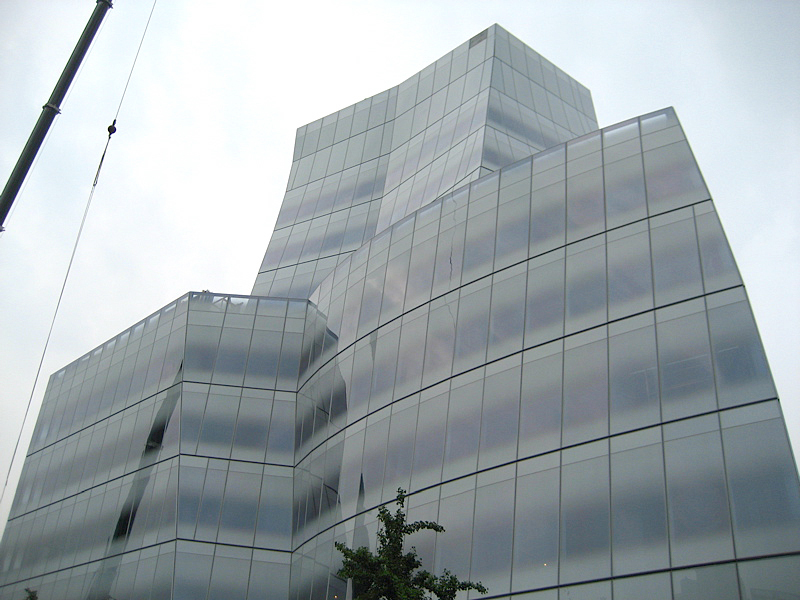 The glass is treated with what appears to be a layer of white film that frosts away in bands at each floor. The whiteness works well in the West Chelsea location, particularly on an overcast day: with no tall buildings behind it on the approach from Tenth Avenue, the building takes on the characteristics of the sky, much the way Meier3 does. IAC has a similar minimal white frame treatment to Meier3, but, of course, with each panel warped. 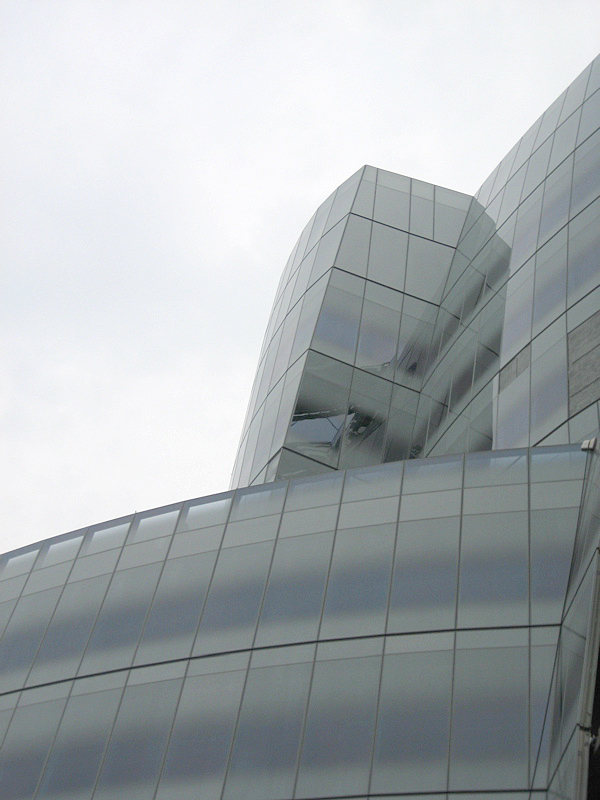 It's an understated bravado, an elegance we're happy to see Gehry return to after dozens of metal-skinned buildings. 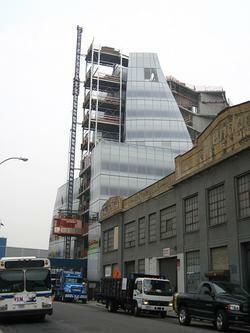 The building also reflects the crazy graffiti-eque colored billboards on Chelsea piers.